C.A. Sharp is a science writer and an internationally recognized lay expert on canine genetics and hereditary diseases. She is journal published (“Collie Eye Anomaly in Australian Shepherd Dogs” Rubin, Nelson and Sharp, Progress In Veterinary & Comparative Ophthalmology, 1991, 1(2):105-8 and “KITLG maps to canine chromosome 15 and is excluded as a candidate gene for merle in dogs, ” Schmutz, Berryere and Sharp, Animal Genetics, 2003 Feb;34(1):75-6.) and also co-author of a July 2018 conference poster presentation (A Survey of Australian Shepherd Breeding Practices and Genetic Diversity” Bennet-Wimbush, Suagee-Bedore, and Sharp). 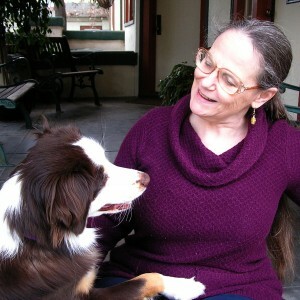 Most of her published work has consisted of genetics and hereditary disease articles for dog breeders and owners. From 1993-2014 she published the award-winning Double Helix Network News. She received the AKC Canine Health Foundation’s Golden Paw Award for her article “The Rising Storm.” Her writings and DHNN earned four Dog Writers’ Association of America “Maxwell” awards, including one for “The Price of Popularity,” on the impact of popular sires on breed population genetics. Her articles for lay readers have been published, reprinted, or translated in a wide variety of dog magazines, websites and newsletters the world. Sharp has been in dogs, specifically the Australian Shepherd, since the early 1970s, breeding and showing through the early 90s. She has been a member of the Australian Shepherd Club of America since 1976 and the United States Australian Shepherd Association since 2005. ASCA presented her with its Lifetime Achievement Award in 2007. In 2001 she and others formed the Australian Shepherd Health & Genetics Institute, a state (California) and federally registered not-for-profit corporation. ASHGI exists to provide breed health related education and services to owners and breeders as well as to promote research on Australian Shepherd health issues and breed genetics. She also conducts seminars for dog clubs in the US and Europe. From the mid-1980s Sharp has collected data on hereditary disease in Australian Shepherds, data which is now part of ASHGI’s International Directory for Australian Shepherd Health (IDASH). She has used this information to assist researchers as well as to provide informal genetic counseling and pedigree analysis for breeders and owners, first independently and later for ASHGI. Sharp has frequently assisted researchers in canine genetics on projects ranging from coat color to ophthalmology to longevity. Her efforts include spreading the word about the projects, educating people about the subject of the research, and facilitating data collection. ASHGI has, to-date, provided over $100,000 in grant support through Morris Animal Foundation and the AKC Canine Health Foundation.